We all have our habits and favorite apps that help us stay on top of everything. Using multiple mobile devices and being a fan of productivity apps - I’ve developed a few habits of my own. Everyone uses cloud storage, however many of my friends are still saving most of their documents in their local storage and only copy specific files to the cloud upon their need. Using multiple devices (2 laptops, few smartphones and 2 tablets) I found that the best practice for me is to keep EVERYTHING in my cloud folders. It could be Dropbox(my favorite), Box (I like it too), Google Drive (I’m actually using it as well), OneDrive (hmm, weird, seems like I use them all) - it doesn’t really matter, but the principle is to turn the cloud environment into your default playground. Whenever I need a file - I can find it, regardless to my location or the device I’m using. It’s a serious productivity boost when I’m on the move or just too lazy to open my laptop. So tip number #1: If you are using Windows - forget about “My Documents” and place a shortcut to your cloud folders in the top left corner of your Windows Explorer. If you are using Mac - configure a shortcut in Finder. From this moment on - all your documents are available to you from all of your devices. I’ve been using Pocket for many years now, and I’m still surprised to see that most people are not familiar with it. The problem is pretty common, I think; while browsing for information we often run across interesting articles (links, related stories, etc. ), and open them in separate tabs in order not to lose them. This is a bad habit for your computer (chrome chokes your memory when you open too many tabs) and a horrible habit for your work as it distracts you from your main task. Pocket is designed exactly for that: the app stores articles you wish to read later and makes them available also for offline reading on your laptop, tablet or phone. There are various ways to store articles in Pocket (from email address to an iOS extension or a browser plugin) so there is really no need to keep those tabs open forever. Just hit a button and save the article for later reading while remaining focused on your original task. Tip #2: download Pocket, configure it to work on all of your devices and start storing articles for night reading. Many people are listening to podcasts while driving to the office. I do it too, but I also use a nice iOS trick to turn my phone into a talking machine. Under accessibility, I turn on the ‘Speak Screen’ option and use it to listen to emails, articles or other documents when I’m in my car. 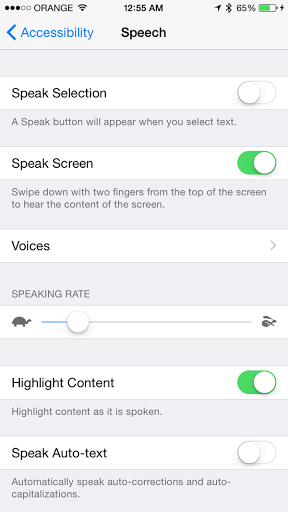 Once configured, activating the speaking system is very simple: you just need to slide two fingers across the screen and iOS will start reading it for you. The speaking person does sound a bit robotic, but the bottom line is that the information is passed. With tip#3 you can save some reading time by listening to your favorite articles while on the move. Most of us have a few email accounts. While it sometimes makes sense to have all of them in one email app, I took a completely different approach and installed an email app for each account: I have one email app for my Gmail account, one for my work, and one for my rarely used accounts. The advantage? First, you get to see things in their right context. Second, you get a more accurate badge per account. Third, it’s easier to follow emails when they are listed in smaller lists. 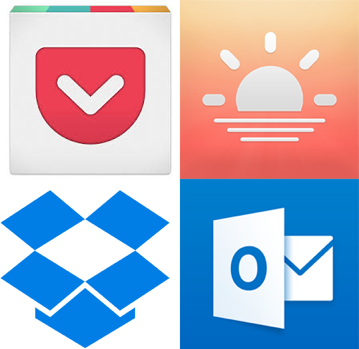 Tip #4: Install Microsoft Outlook, Boxer, and other great email apps and assign an app for every account you use. This one is a relatively new trick I got from a friend: If you are into productivity apps I assume you have more than one todo app (I’m guessing you are using 2-3 of the following: Trello, Wunderlist, Any.do, Todoist, Evernote , etc.). Having multiple todo apps is sometimes addictive, but since most of them usually end up storing endless lists of action items you will never have time to perform - it’s sometimes better to give those action items a visual meaning and a sense of urgency using a calendar view. This is exactly what Sunrise is all about: it lets you integrate most of your services with one calendar app. The list includes the likes of Trello, Wunderlist, Asana, Google Tasks and many others. The beauty about Sunrise is that it is available on all the platforms and provides a very pleasant experience managing all of your meetings and action items in one place. As a bonus, you can also link it to your Meetup and Eventbrite accounts to see events that might interest you next to your daily agenda. With tip #5 you can become a time master by having an all-in-one calendar view, and have this super-calendar available across all of your devices. (including Windows and Mac). So there you go. 5 ways to increase your productivity when using any mobile device. Let me know what works best for you. Spark for iPhone helps me handle my multiple e-mail accounts. My tip: I have a list of things to do when I have a spare minute or two ("low priority todo's", if you will). I put this list on my Android's home page so it is always visible. You know how when you have a few minutes with nothing important to do, you immediately look at your phone? When I do this, the first thing I see is this list and I'm reminded this is a good time to cross something of it. I'm using ColorNote as my todo app.